Intelligent magic items are so much fun... especially for the GM! Publisher's blurb: "They could all be your next intelligent magic item. 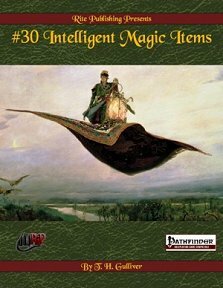 With #30 Intelligent Magic Items by T.H. Gulliver you'll find more than just another specially-purposed sword, ready to possess your warrior for retail therapy with scabbard accessories. You'll find planar explorers, hopping across the Beyond in the hands of adventurers. You'll find dedicated preservers, sworn to perpetuate royal houses. You'll find social liberators, bent on destroying immoral cruelty wherever the can find it. You'll find bloodthirsty conquerors, ruthlessly intent on carving out empires. "#30 Intelligent Magic Items offers a wide array of objects with rich backgrounds, personalities, and goals to rival any NPC, all packaged in a magical device certain to add an element of mystically fantastic to your game. Why wonder how to introduce your next story hook when your characters can simply take it as spoils? Pick up #30 Intelligent Magic Items and let your characters learn adventure lurks everywhere - especially in their loot!"